Who doesn’t love Christmas Markets? Lots of people go abroad to the great Christmas Markets of Europe to experience the festive winter wonderland atmosphere and to taste the famous mulled wine and Christmas treats. Here are some of the Dublin Christmas Markets 2018 has on offer. The merry Christmas Market on the Metals (The Metals walkway provides a link between Dún Laoghaire and Dalkey and is approximately 3.5km long) will have delicious Christmas fare, handcrafted gifts and decorations, a funfair with a children’s carousel and lots more tempting treats. It’s all part of the Dun Laoghaire Christmas Festival. Great if you want to avoid the crowded city centre. This year’s unique attraction is the Ferris wheel used in the movie Grease. The Dublin Flea Market has 280 stall in total (approx 140 each weekend). No two stalls are the same and there are no mass produced manufactured goods on sale. Good of the best Irish-based creatives, start-up companies and small businesses including artists, designers,crafts people, antique collectors, artisan food producers and more are on display. You will not find most of these products in the high street shops, shopping centres or supermarkets, so this is the ideals place to go if you are looking for a unique Christmas gift. 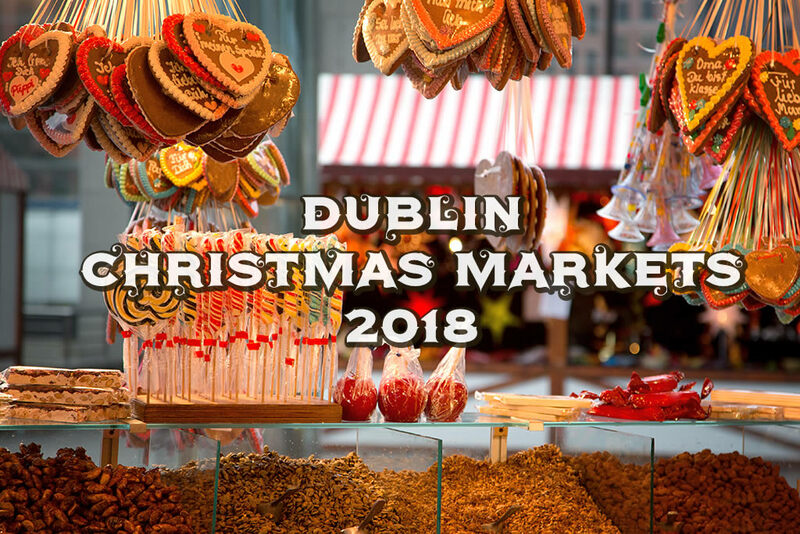 Our choice of Dublin Christmas Markets 2018! 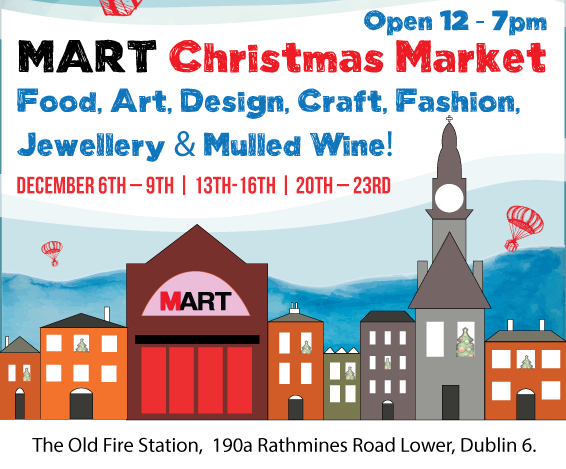 This is the sixth year MART Christmas Market. It is located in the old fire station on Lower Rathmines Road, and hads an array of stalls selling Food, Art, Design, Craft, Knits, Fashion, and Jewellery. Dates: December 6th – 9th | 13th-16th | 20th – 23rd. Running from 12-7pm each day. See http://www.mart.ie/market/ for more details. Date: Saturday, December 8th from 10am. There will be quite a few local artisan businesses in attendance, with lots of tasty offerings, including some of Teeling’s own food collaborations. There will be a selection of fashion, interior and artistic products to choose from. This is a good opportunity to get some very special Irish craft gifts for Christmas. 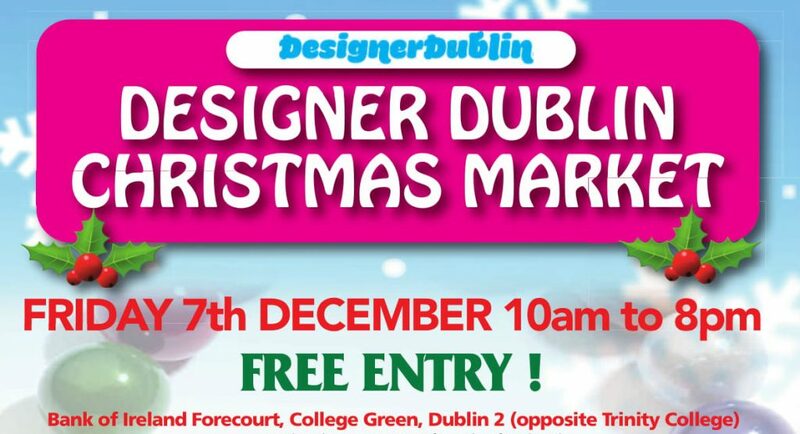 The Designer Christmas Market at Bank of Ireland Forecourt on College Green features quality Irish made Christmas gifts. On offer will be everything including fashion, jewellery, toys, crafts and food items, all which are handcrafted in Ireland. Irish Village Markets together with Fingal County Council are bringing some Christmas magic to North Dublin. There will be over 40 Christmas stalls, as well as music and entertainment for the children. Friday: Turning on of the Christmas Lights. Visit Santa in his grotto after the ceremony. Saturday: Santa’s Grotto will be open from 11.00am – 5.00pm. The Botanic Gardens in Glasnevin will be transformed into a winter wonderland where you can savour the festive atmosphere. The Christmas Market is open all day and you can stock up with Christmas goodies, presents and lots of Christmas supplies at the various stalls with the music of a live choir in the background. And of course there will be Santa with lots of excitement for the children. The craft fair at Clontarf Castle Hotel will have over 50 stands full of great Christmas gift ideas.